On 19th February 2017, I had the rare privilege of interviewing a visionary, a managing partner of DnS Corporation. Here is the inspiring story of a young man who had a great vision and was not afraid to start small; a story of commitment, integrity, hard work and passion. Onomewrites: Can we meet you? Mr. Divine: My name is Nifemi Oluyemi Divine; I am a Managing Partner of DnS corporation, a company that specialises in Web designs/development, branding (cloths and business), graphic designs, animations, cinematography, networking, digital marketing and lots more. The company is located in Ibadan, Oyo state of Nigeria. I am a graduate of Forestry and Wildlife Management from the Federal University of Technology, Akure. Onomewrites: What exactly is the meaning of DnS? Mr. Divine: DnS means Divine and Samson Corporation, which is exactly why the ‘D’ and the ‘S’ is always in capital. Onomewrites: Wow! So who is this Mr. Samson? Mr. Divine: Let’s say we are two cool guys who share same vision and passion. When I got the vision to start a company, I realized the vision is bigger than just me. So, I spoke with him about it and we just clicked. And there you have it; DnS Corporation. Onomewrites: So tell us, how did you meet Mr. Samson? 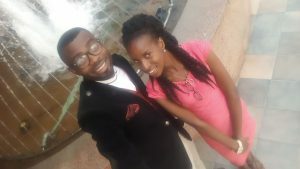 Mr. Divine: (smiles) Our meeting was kinda funny ooo. I was travelling to Port Harcourt to the State’s NYSC Orientation Camp, for the mandatory one-year service to the fatherland as a young graduate, from Akure and fortunately, he happened to be sitting by the window side of the mid-row seat of the bus I was on while I sat near the door. That’s right, we met on a bus. While on our way, I went eavesdropping (smiles) on his phone conversations and from those calls, it was obvious he is an IT guy. As soon as we had a stopover, that was in Onitsha, I decided to chat him up and our connection was almost instantaneous. The IT savvy part of us took over and as they say, the rest is history. Onomewrites: Interesting. Tell us about your journey from being an employee to an employer? Mr. Divine: (laughs) Onome! Okay, although I’ve always known there was more to me than working under somebody, I also knew I had to start small. My journey so far; I got my first job at P-hub while still an undergraduate and worked there for a while before getting another job at Play as a Graphics Designer. I was given a two-week probation but after a week, they were pleased with my job and they forgot about the probation. I was with them for a month or two before I stopped going. I was just not comfortable being confined for a whole day and so again, I joined another establishment, which was Ultimate Travels and Tours; I was their project manager for a month before I resigned. I was on my own, trying to secure contracts and gaining ground while still learning and growing; then one day, someone just called me to design an application for the University of Maiduguri. I asked them to pay ₦50,000 but the guy who got the contract for me advised that what I was charging was too little for a University; that they would think I’m not good at my job. I didn’t know how to charge back then, and so I made some calls, spoke to some senior colleagues about how they bill their clients and they made suggestions how I should go about it. I charged the University the sum of ₦600,000 and to my surprise, they didn’t even negotiate. Once I got that pay, I just know within me that it was time to step out and standout; and so that was how we started DnS Corporation. 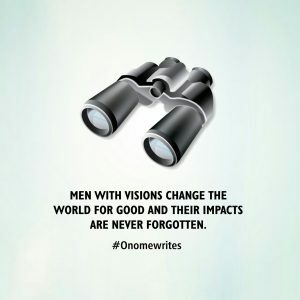 Onomewrites: What has this company been able to achieve so far? Mr. Divine: Our major goal is to offer solutions, I came up with the idea of designing an online drug store, I asked around from hospitals and pharmaceuticals where they get their drugs and some told us they get it from the markets. We decided to design an online platform where pharmaceuticals could upload their drugs and they could be delivered to the buyers. However, to proceed with the plan, we needed approval from the Pharmaceuticals Association of Nigeria; they loved the idea and gave us go ahead. The platform was designed and the name of the website is quicken.com.ng. A lot of drug manufacturers are already on the platform while we are still working on new ideas every day. Onomewrites: When did your love for IT start? Mr. Divine: Hmmmm… My love for IT started when I was in my third year in the university, there was this 6 months ASUU strike and so I decided to use my spare time for something good. I started learning graphics, I downloaded dozens of videos on YouTube and even after the strike-action, I never stopped learning. Every single time I did a data subscription on my phone, I told myself my money must yield good results; something I called “Return on Investment” and so I maximized every opportunity. In my final year, I started learning web design. Onomewrites: Where do you think you stand now in the world of Information Technology? Mr. Divine: I thank God for grace, last year a survey was carried out and just three graphic designers were identified, or more like qualified, in Nigeria; myself and two other guys. The guy designing for Jumia came out as the best while I ranked next. Onomewrites: Wow! That’s really nice, congratulations sir. Mr. Divine: (smiles) Thank you. Onomewrites: How many members of staff do you currently have in your company and what are the criteria for employment? Mr. Divine: At the moment, we have about 22 employees at DnS. We don’t employ based on qualifications because we deal with intellect. If you are good enough and you are willing to work hard at it, that’s all we need. Onomewrites: Sir, permit me to digress a little bit; what’s your take on the subject topic that a Visionary needs a Confident Woman? Mr. Divine: (laughs) Onome this is not a relationship interview now. Hmmm… well, I quite agree that a great man needs a great woman. I’m in a relationship and I can say from experience that my woman has been a real source of inspiration; she’s been a manager and a great partner. So… Yes! A Visionary needs a Confident Woman. Onomewrites: Where’s the place of God in all this? Mr. Divine: God… God… God! He’s the one factor that is indispensable. He gave the vision and He has been backing it up; God is the brain behind DnS. So, God is the most important factor. Onomewrites: So finally sir, what’s your advice to young ones who wants to be a CEO soon? Mr. Divine: Don’t stop learning, be teachable and be humble; don’t ever forget the place of God. It’s a tough world out there and so you need God to survive. Onomewrites: Thank you so very much for your time… We really appreciate you Sir. Mr. Divine: (smiles) It’s an honour and a great privilege. Thank you for having me. “Your visions will become clear only when you can look into your own heart. Who looks outside, dreams; who looks inside, awakes (Carl Jung)”. Look inwardly and you’ll realize there is more to you. Never give up on your visions and never stop dreaming new dreams, and I can bet you the sky is only your starting point. You can do better as long as you don’t give up. I’d like to say that this should be a wake-up call to someone out there who’s afraid to start small. Keep it up Mr. Divine, you’re destined for greatness. Thumbs up to #OnomeWrites for this, keep soaring. Get more for guys to gear up onome!! !